Home /On the Aeriaa Airport Dashboard (part V) – Time milestones. On the Aeriaa Airport Dashboard (part V) – Time milestones. Before processing thousands of events, scenarios, etc. for feeding the Dashboard, I would like to show the a dimension that put in context almost every event. The time dimension. Delays are the “Oh, no, a delay again, what was the captain reason this time?” The late arrival of the plane, air regulation over the airport…I heard once that the guilty factor was the “shamefulness of being part of an airline because the ramp handling staff were late….some other details were given by the captain and it was a gesture of honesty”. We, the passengers only concern about only time milestone, the scheduled departure time of our flight, and pray for not have a big delay, but there are always 10, 15 minutes of courtesy. In this post, you will see dozens of time milestones, that impact over all the punctuality process of the flight operation and consequently will be marked in the Dashboard we are defining in this blog (this is the part V of this series). The next graphic shows the general process of a flight turnaround from the arrival to the departure. In the next time lapse video, you can see the a Lufthansa turnaround process, including the arrival flight en-route track, ATC conversations, and the destination’s enroute track. Great video of the AirportFreak Blog. ACZT Actual Commencement of De-icing Time The time when de-icing operations on an aircraft starts. AEZT Actual End of De-icing Time The time when de-icing operations on an aircraft end. AIBT Actual In-Block Time The actual date and time when the parking brakes have been engaged at the parking position. AOBT Actual Off-Block Time The actual date and time the aircraft has vacated the parking position (pushed back or on its own power). AROT Arrival runway occupancy time The time interval between the aircraft crossing the threshold and its tail vacating the runway. ARZT Actual Ready for De-icing Time The time when the aircraft is ready to be de-iced. ATA Actual Time of Arrival The time at which a craft arrives at a specified point at a destination. ATD Actual Time of Departure The time of leaving a specified point at a place. The actual time an aircraft becomes airborne. CLDT Calculated LanDing Time A flight’s frozen calculated landing time. COBT Calculated Off-Block Time CTOT (Calculated Take-Off Time) minus taxi time. CTA Controlled Time of Arrival An ATM imposed time constraint on a defined merging point associated to an arrival runway. CTO Controlled Time Over An ATM imposed time constraint over a point. DROT Departure runway occupancy time The time interval between [the aircraft] crossing the stop bar at the holding point and the main gear lift-off from the runway. EAT Expected Approach Time The time at which ATC expects that an arriving aircraft, following a delay, will leave the holding fix to complete its approach for a landing. EDCT Expect Departure Clearance Time The time issued to a flight to indicate when it can expect to receive departure clearance. EDCTs are issued as part of Traffic Management Programs, such as a Ground Delay Program (GDP). Aircraft engaged in passenger carrying operations but not certificated to carry more than 19 passengers – 180 minutes. ETA Estimated Time of Arrival (ICAO) For IFR flights, the time at which it is estimated that the aircraft will arrive over that designated point, defined by reference to navigation aids, from which it is intended that an instrument approach procedure will be commenced, or, if no navigation aid is associated with the aerodrome, the time at which the aircraft will arrive over the aerodrome. 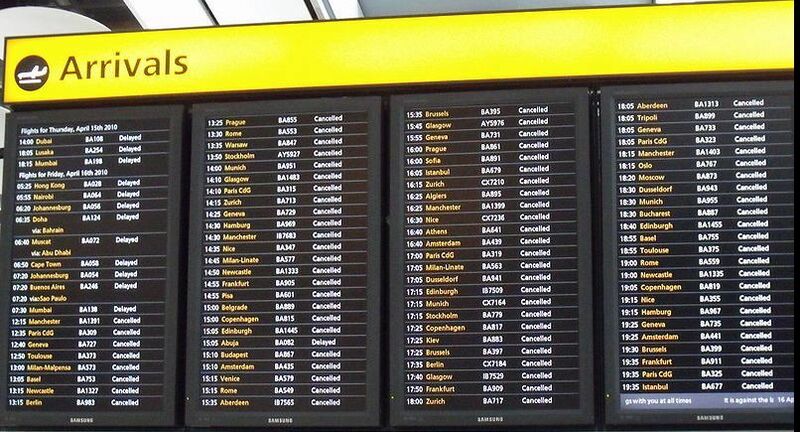 For VFR flights, the time at which it is estimated that the aircraft will arrive over the aerodrome. ETD Estimated Time of Departure The estimated time at which an aircraft will become airborne. ETO Estimated Time Over significant point Estimated entry time over an airspace for a non-regulated flight based on flight plan data and Environment Database (ENV) data. The estimated take off time taking into account the EOBT plus EXOT. ETT Estimated Time Interval The earliest/latest ETA at a waypoint, provided the aircraft flies the 4D Trajectory at its max/min allowable speed, wind/temp error is also taken into account, in order to guarantee that any CTA defined within associated ETA min/max interval will be satisfied with high probability. ETTA Estimated Time Of Turn Around The time estimated by the AO/GH (aircraft operator/ground handler) on the day of operation to turn-round a flight taking into account the operational constraints. EXIT Estimated Taxi-In Time The estimated taxi time between landing and in-block. EXOT Estimated Taxi-Out Time The estimated time between off-block and take off. This estimate includes any delay buffer time at the holding point or remote de-icing prior to take off. FRTT Flight crew reaction time to ATC take-off clearance The time interval between the ATC clearance for either line-up or take-off and commencement of taxiing to line-up. IOBT Initial Off-Block Time The off-block time as given in the FPL and updated by flight plan associated messages (DLA, CHG, etc.). LUPT Line-up time The time interval between crossing the stop bar and the moment the aircraft is fully lined up. ROT Runway occupancy time The amount of time that each aircraft occupies the runway. STD Scheduled Time of Departure The scheduled time at which an aircraft will become airborne. STOT Scheduled Take-Off Time Thescehduled take off time. Targeted Time from the Arrival management process at the threshold, taking runway se- quence and constraints into account. It is not a constraint but a progressively refined plan- ning time used to coordinate between arrival and departure management processes. Each TLDT on one runway is separated from other TLDT or TTOT to represent vortex and/ or SID separation between aircraft. TTA Target Time of Arrival An ATM computed arrival time. 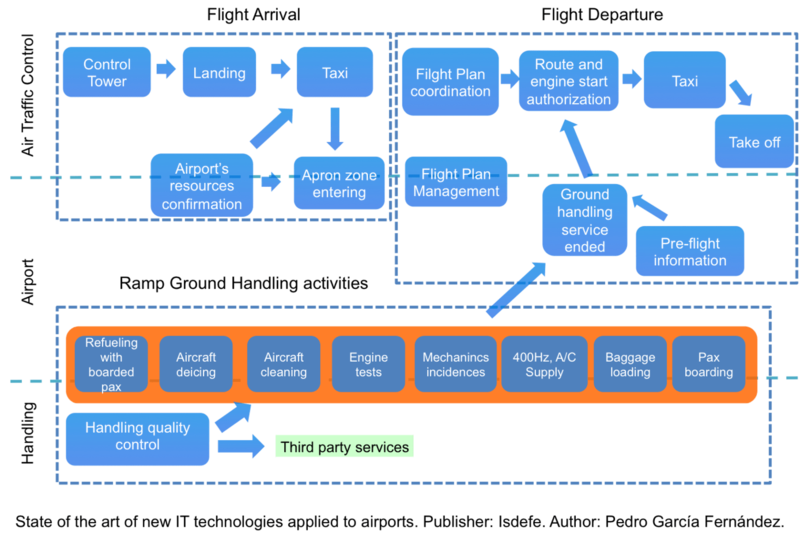 It is not a constraint but a progressively refined planning time that is used to coordinate between arrival and departure management applications. The Target Take Off Time taking into account the TOBT/TSAT plus the EXOT. Each TTOT on one runway is separated from other TTOT or TLDT to represent vortex and/ or SID separation between aircraft. VTT Variable Taxi Time The estimated time that an aircraft spends taxiing between its parking stand and the runway or vice versa. WAIT Wait time The time interval measured between the completed line-up and the ATC clearance for take-off. I’m sure that there are more milestones, but I wanted to point out the relevance of the dozens of temporal milestones regarded to aircraft and airport operation, so measure them is basic for any airport dashboard. So we will count some of them in ours. A-CDM Implementation Manual. Eurocontrol website. Civil Aviation Safety Authority. Australian Government.